If you know it’s that time when you have to say “Good-bye” to the old and “Hello” to the new then you simply must check out this online store of famous designer timepieces: Helloreplicawatches.com. Chances are that it will enrich your collection with new and wonderful imitation watches. What I just couldn’t help but notice was its tag line “What you see is what you will get”. This is basically what any online shopper wants to believe, that when you are buying something on the Internet you will always receive what you were promised. The sad part is that this rarely ever happens, especially when it comes to replicas. Precisely for this, we need to be smart, patient and careful when picking out an online source of imitation designer watches. From what I have noticed the prices start at $100 and go up to $500. The less expensive watches are equipped with a Japanese automatic movement while the more pricy ones have a Swiss ETA mechanism. Unfortunately, without an option of filtering the items you just have to go through hundreds of models just to find the ones with the desired movement or within your budget. The nice part about this website is that it presents a very detailed and accurate description for all of its products. It really helps you out to clearly understand what the technicalities of these watches are. All packages are shipped with a tracking number. Additionally, the customer can choose whether to get free shipping by registered mail or to pay for the faster options such as EMS or UPS. The slower, but free delivery takes about 15-25 days while the express one implies only 8-14 days of waiting. If you were wondering what are the costs of EMS or UPS delivery then you must know that it varies between $10 and $50, depending on the destination country. 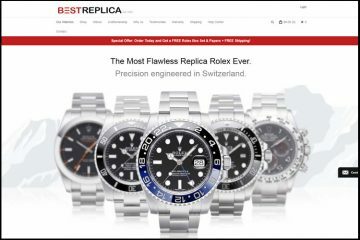 The page of Helloreplicawatches.com doesn’t look at all like an online replica store. 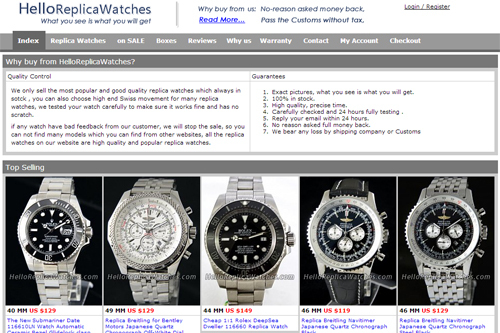 Its cold, sectioned homepage resembles more to a forum than to an e-shop of luxury imitation watches. I have to say that it doesn’t convince me that I should waste more than a couple of seconds on it, not to mention to actually purchase something from this place. Let’s not forget that the Internet is all about appearance and a poorly designed website is a huge disadvantage for any seller no matter how good its products are. The website is quite difficult to browse. The top menu is over-stuffed with links to informative pages and when you click on the Replica Watches button it randomly loads 555 of its most popular clone watches. The actual product menu buttons are somewhere in the left and it is barely visible. The actual collection isn’t very impressive as it only lists a few famous brands, but considering the low usability of the website then you could say that it is probably for the best. Helloreplicawatches.com accepts payments by credit card- but it doesn’t say what types-, by Western Union and also Bank Transfers. Curious to see what are those supported cart types I added a product to the shopping cart, checked out and filled in the shipping details. Next the website said that I could enter a Mastercard or Visa, but, actually, in the card payment form I could only select Visa. Mastercard was unavailable. Pictures: The photos look unbelievably good, just like professional pictures of actual replica watches should look like. 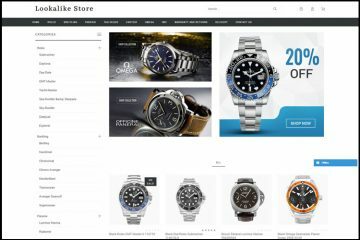 You can tell that these images are of the products being sold here at Helloreplicawatches.com. The quality is very good, the clarity is just perfect and all the photos are relevant as they manage to capture all the important parts and details of these beautiful imitation watches. Honestly, after you have seen the pictures of a few products you may find yourself convinced that their motto might be true “What you see is what you will get”. 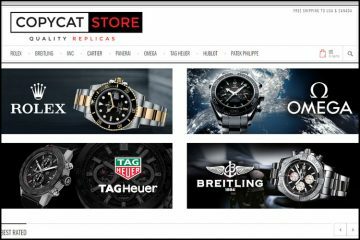 Customer service: This is another one of those online replica companies that does not offer any type of reliable, reachable, trustable customer service. The only way of contacting the customer care department is through a Contact Form available on the website. It does not provide a phone number or email address so that it can be used by its customers or potential clientele. 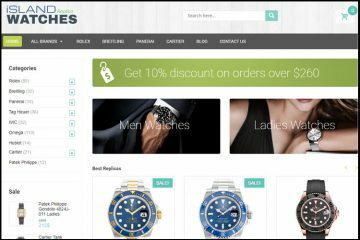 Summary: Helloreplicawatches.com is an online seller of imitation timepieces that offers us a diverse collection of luxurious designer models. Judging by the very accurate and professional photos of its products, these replicas are of very good quality. It is certainly worth paying a couple hundred dollars if in the end we will be getting such exquisite knockoffs.